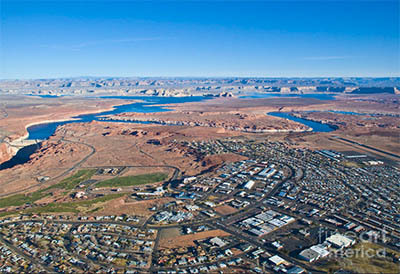 With Lake Powell and the Colorado River on its doorstep, Page, Arizona puts you right at the heart of unparalleled outdoor beauty and is your home base for hiking, biking, boating, and off-road adventure. Page is in the center of over 40 National Parks, National Recreation Areas, National Monuments, and Tribal Parks. Just hours from the Grand Canyon, Zion and Bryce Canyon National Parks, Monument Valley, Rainbow Bridge, Grand Staircase-Escalante and the Vermillion Cliffs, Page is your base camp for wilderness discovery. Page is surrounded by geological formations that are iconic in the American West. Hollywood has long known of the wonders of Page, filming such features here as "Broken Arrow" and "Into the Wild.". Located beside Navajo Tribal lands, Page is rich in geographic, cultural, and historic marvels to explore. On October 15, 1956, the first blast occurred and the construction of Glen Canyon Dam was officially underway. Before that date, the site was virtually inaccessible and construction crews were forced to drive 200 miles to cross from one side of the Glen Canyon to the other.